This being Labor Day, you might be interested in the tools of the trade that comprise a life in tennis media. We concede that this is hardly a zone for the environmentally conscious. Each day, a tournament puts out so much paper that you could kill enough trees to line an Oregon forest. Before the tournament even begins, the USTA creates a massive media guide and record book. Clocking in at 290 pages, this volume includes everything from the capacity of each stadium court to round of 16 results from every US Open to a year-by-year summary of notable US Open moments. The book is a tennis goon’s delight. And while it’s likely that the only person who would read it cover to cover has never been on a date, it’s useful beyond belief in all sorts of random ways. Try hunting down the most aces ever hit in a match and you’ll see what I mean (per page 220, it was Ivo Karlovic, with 76 in his 2016 first round win over Lu Yen-Hsun). Then there are the two annual media guides prepared by each tour, chockful of biographical information, rankings, tournament titles won, Grand Slam resumes and so on. Did you know that Roger Federer enjoys playing cards? That prior to 2017, Kevin Anderson had won more matches at the US Open than any other major? On a daily basis, the WTA and ITF each prepare multi-page documents on the day’s matchups – the head-to-head rivalries, the player’s record in tiebreakers, a man’s five-set record, comebacks from two sets to love down, a woman’s in three-setters. Yes, indeed, all this data you hear and see doesn’t merely come into our heads. Legions of men and women spend many a long day into evening hunting and gathering dozens of details. Throughout the day, more paper surfaces, mostly in the form of interview transcripts, a daily package of media clips and statistical summaries of matches that detail unforced errors, winners, serving data and more. Then there is a simple mini-magazine created daily by the tournament – schedule and draws by far the most-read sections. Above each desk is a large TV with several channels – courts, networks, more statistics, draws, news stories and more. And let us not forget that other tool called the Internet. All day long, reporters trek across the grounds – from their desks to the courts, to the player lounge, to practice courts, to press conferences and back and forth, again and again. So how to synthesize or even deploy any and all of this data? The answer: Utterly randomly and personally, strictly based on the needs of a given day (and night), be it matches, players, countries, courts. 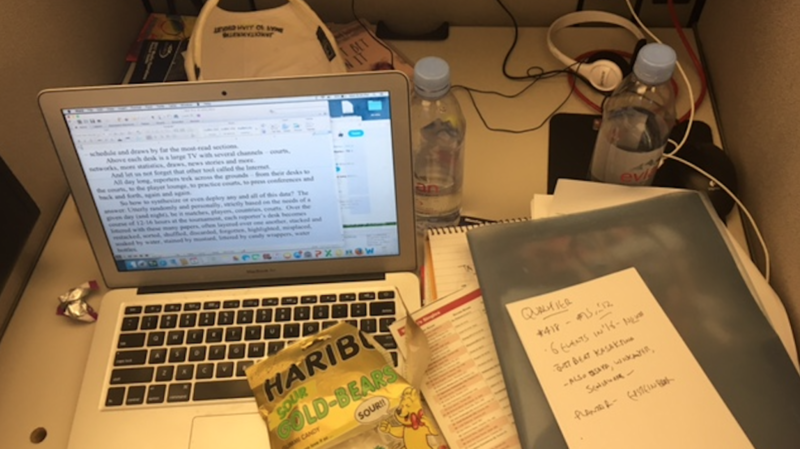 Over the course of 12-16 hours at the tournament, each reporter’s desk becomes littered with these many papers, often layered over one another, stacked and restacked, sorted, shuffled, discarded, forgotten, highlighted, misplaced, soaked by water, stained by mustard, littered by candy wrappers, water bottles. We won’t bore you with how stories are written. And this one is over.